"Welcome. Delicious Friend" is the greeting visitors receive when entering this "dark and hilarious Victorian-Gothic underworld, where every choice has a consequence, from the style of your hat to the price of your soul." The underworld is a London that was "stolen," now located a mile below the Earth and..."waiting for you." Consider the review below before proceeding into the iOS version of this originally browser-based game.... 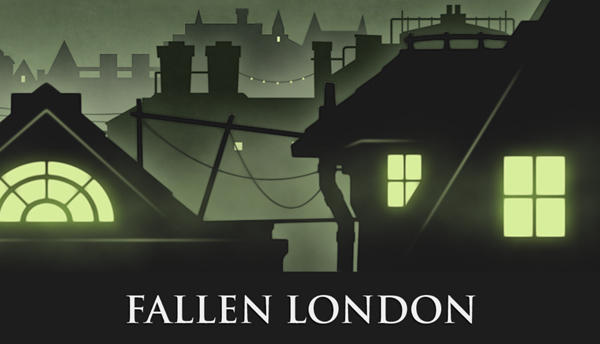 Fallen London (Failbetter Games. 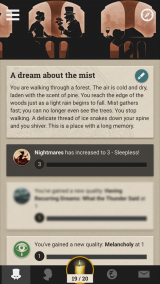 iOS, Free with IAP; Gr 7 Up) is a text-based adventure set in a Lovecraftian dream of Victorian London. Players build up qualities that will help them succeed, and their "dangerous," "persuasive," "shadowy," and "watchful" scores will determine the likelihood of succeeding at various challenges. But many other variables can affect whether players will succeed or fail.